As Australia’s workforce expands towards 10 million over the next decade, most of the growth will come from groups aged 45 or more. While this group accounts for about a third of all workers now, it is expected to expand dramatically as the Baby Boomer population bulge moves through the workforce, says safety, ergonomic and anti-fatigue mat authority Mr Michael Siegle. “This means employers will increasingly have to focus on adapting their workplaces to account for an older workforce, particularly in employment where extended periods are spent standing,” said Mr Siegle, an expert witness in court cases involving accidents and workers compensation, as well as being Managing Director of the national General Mat Company network. The General Mat company used National Manufacturing Week from June 1-4 to launch some of the world’s latest safety, ergonomic and anti-fatigue matting, including Ultra-Soft Diamond Plate No 414, a 20mm thick general purpose mat with bevelled edges for safety and a very high, non-slip friction coefficient of .68 Dry per American Standard ASTM F1677. GMC also showed its PowerBuy Range, Orthostand® commercial and industrial matting, and Waterhog and Multi Guard matting designed to stop workers and visitors bringing hazardous and slippery material into workplaces and public buildings. Mr Siegle says sprains or strains of joints or adjacent muscles now account for more than 50 per cent of new workers compensation cases recorded by the National Occupational Health and Safety Commission. The total of such injuries now exceeds 61,000, according to the latest NOHSC figures - and is likely to rise again as Australia’s workforce ages and a less nimble and resilient workforce becomes more prone to falls, slips and trips and plain wear and tear on older bodies. “Just the simple act of standing eight hours every day for years can be hazardous to workers health. It will certainly take its toll on your body: varicose veins, lower back pain, leg pain, fallen arches are just a few of the most common ailments. And ultimately this wear and tear on bodies will expose workers and their employers to a greater risk of slips, falls, and chronic back injury,” says Mr Siegle. 24/7 high performance mats for heavy commercial and industrial use. Part of the GMC’s economical PowerBuy range, the durable 15mm thick rubber mats include 24/7™ 570-WH and 24/7™572-SOL mats provide supple, comfortable and secure footing 24 hours a day for people working in wet and greasy areas (WH types) and in predominantly dry areas (SOL types). Ortho Stand® commercial and industrial matting with a domed surface to provide a massaging feeling while encouraging beneficial changes in posture. Waterhog and Multi Guard entrance matting, which is designed to scrape grime from shoes to exclude dirt from commercial premises while providing a sure footing. Happy Feet anti-fatigue matting for commercial and industrial premises. This matting (used nationally by Woolworths at checkouts) seals a dense shock-absorptive cushion within solid, nitrile rubber to withstand industrial deterioration caused by chemicals, animal fats, petroleum products, and even the heels of employees’ shoes. Ultra-soft Diamond Plate No 414. Featuring GMC’s best-selling diamond plate tough vinyl surface on its double-thick Nitricel® sponge base, Ultra-Soft Diamond Plate No 414 is particularly suitable for manufacturing industries with an ageing workforce, says GMC. 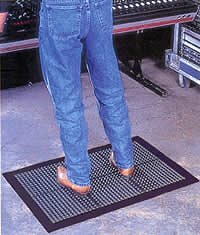 This mat is very durable with a high Tabor abrasion performance of one per cent losses at 1000 cycles (as per Federal Standard 193 – Tabor tests determine how well a mat will hold up to heavy use. The less weight a sample loses, the more durable the product tends to be).